Something that I've been thinking about, is to bring into TBs the possibility for some of you to sporadically send your own content proposals. This would be something like a GuestBlogger section as we have seen for instance in 'The NXT STEP' blog. So, even before going to write any suitable guidelines for guests to subsmit their posts, I decided to give it a try. Sometime ago, Jacob wrote me about how he has been trying to get the TECHNIC community in one place on Flickr, and how it has been difficult. He was thinking how to offer an alternative, though: only a small portion of TECHNIC builders actually tag their models "lego_technic", so it may not be the most reliable method of collecting images. Jacob then mentioned there is, however, a group that was created a while ago which has been slowly growing for some time: LTEC. I found it interesting and worthy to mention here, so asked Jacob to write a few lines about the subject, and here it goes. On each photo, in addition to text comments, users can add things called notes. Notes are outlines of boxes that are placed directly on the image and display a message when you hover your mouse over them. Don't worry about images getting cluttered up, though, because the notes disappear when you move your cursor off the picture. Perhaps you can already see the usefulness of this: instead of trying to type out exactly what you're talking about when commenting on a model, you can simply point to it! You can directly control the photos you see. If you see a builder on Flickr that has a lot of things that interest you, and you'd like to see his further work, you add him as a Contact. As your contacts add photos to their pages, all of the new images show up on a single page, making keeping track of everything new very easy. It can work in harmony with Brickshelf and MOCpages. Some prefer not to use Flickr as a full gallery, because the aforementioned sites already serve that purpose quite well. However, a very effective hybrid system is to upload a single image to Flickr, and link to a gallery on a different site. There is already an established community of great builders. When starting your list of contacts, you will have no shortage of excellent builders to choose from (except perhaps in the TECHNIC field ). It is not a regional site. Members of the TECHNIC community from all around the world can meet in one place. Sure, there are still language barriers, but a picture is worth a thousand words, isn't it? So, please consider creating a Flickr account. Yes, it takes a couple of minutes, but I guarantee you that it's where the rest of the community is moving, because it works so well. If you do join up, join the LEGO TECHNIC group, LTEC, and use the member list as a basis for finding contacts with similar interests. At Flickr you may either add photos or videos from your LEGO creations. 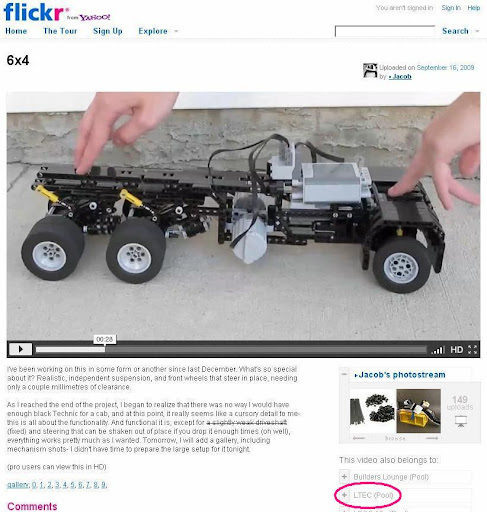 As an example of a model linked into LTEC group, lets take a look into Jakob's new 6x4 truck base below (click on the image to jump into the corespondent video). Secondly, After the troubles at BS finding good Technic MOCs has become ever harder. The community appears to be quite scattered and on top of that those images that were still available at BS are not always easy to find because the search fucntion appears to have lost a lot of information (I can't find a good number of my own pics and I know exactly what folder names and tags to look for). If correct tagging was a problem at BS, at other sites it's even worse, although FlickR appears to be quite reasonable in this regard. But as a very infrequent Flickr user (I'm just starting to get the basics of Picassa) I hadn't realized there is such a thing as a LEGO Technic Group. Your information is therefore just what I needed and I'm getting to work on this right now. Thanks again and I'm looking forward to your future contributions. Just as a matter of clarification, the 'TBs GuestBlogger' tag is not intended for regular contributions of the same author, but for sporadic and relevant contributions. It is also not intended for personal MOC presentations. Regular contributions of one or another are also planned and being prepared, but it has a totally different scope and guidelines. Its a great shame that there is so much dissociation.. and Im not just talking about everyone using different sites! why start a group called ltec, when there is already 'Lego Technic' Group? Oh I see its yours. you are the master. we humbly bow to you. next week another person another site. get over the ego. stop the dissemination use whats there! Thanks for posting this, Fernando! I look forward to seeing the new members. Jacob, Please accept my apologies -I was ignorant of start dates and in a strange mood. sorry. I agree being in one place is better, consequently the new popups annoy me. I had started a LEGO Technic group on Flickr a while ago. Haha, indeed. However, Lego Adam's group is the one anon was referring to- it's the only other group I know of that's been created since mine. Everyone post their flickr profile!!! What's the policy of LTEC? Is it a MOC stream or is anything related to LEGO Technic appreciated (review pics, snoops of future sets, etc, personal collections, ...)? Sorry I'm late, Jetro, but Brickcon and being sick do that. I think I would rather keep the pool to model pictures, if that's okay. The reason I asked is because I couldn't find any guidelines and was surprised to find pictures some of the new Technic sets in the pool. Tell Rosco to do his job on LUGNET, the side bar is 2 years out of date!